Fr. 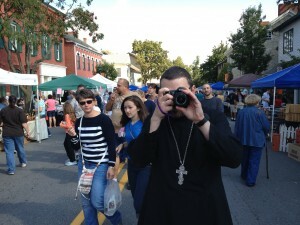 Basil Biberdorf at the 2012 Selinsgrove Market Street Festival. The Chapel of the Holy Spirit has handed out free water to festival-goers each year since 2009. If you have been wondering what is going on at the Chapel, the answer is simple: a great deal, and nothing at all. By “nothing at all” I mean nothing out of the ordinary. Our community continues to gather for worship and prayer, for group study (current topic: the prayers before Holy Communion), for choir rehearsal, for community events, for the support of our faithful and community who need a hand, and, as always, hosting the best coffee hour in central Pennsylvania. But that’s not all. In the past year, the Chapel faithful have sought to determine what’s important to them, as preparation for using the half-acre lot we purchased last year. At the most basic level, four core values were identified: Worship, Discipleship (the cultivation of the Orthodox faith among ourselves), Community (being involved and interested in the people and institutions in our area), and Witness (sharing our faith and exhibiting Christian love to those in need). In support of those values, the Chapel has desired to do several things: offer more educational opportunities, particularly for inquirers and children; expand our service schedule; and expand our “reach” where we are. Currently, we worship in a home, and give thanks to God that we have it available to us. There are, nonetheless, some limitations that accompany the arrangement. We can’t hold very many people, and they’re spread across two or three rooms. We lack space for traditional fixtures such as an iconostasis, multiple icon stands, to say nothing of a narthex. We set up and tear down for each service, putting our Holy Table in the basement and the sacred vessels, antimens, Gospel book, and the like in a plastic box. Our choir has recently added additional rehearsals to the schedule, to improve our worship even further, meeting in a member’s home. Choir materials must be packed, transported, and unpacked for each gathering. Our Sunday evening classes are similar. We want to do more, but there are logistical challenges in meeting at different locations and communicating these details to those who have an interest in coming. It is becoming clear that we need to take additional steps to continue our support for our core values. In spring we began exploring possible floor plans for a church building that would meet our needs, and, having reached agreement on an “ideal” design, have considered what we might be able to afford. Those estimates range from approximately $140,000 to $185,000 total, with $700-1,000 per month in debt service, and a $30,000 to $37,000 down payment. Again, those were estimates according to hypothetical scenarios we developed. We have since spoken with a couple of builders, with one of them proposing construction that would cost between $153,000 (church and narthex alone) and $203,000 (church with parish hall). This is all very preliminary, in that we have not yet determined what we think God is calling us to do. Nonetheless, our picture is becoming clearer week-by-week. We know that whatever we pursue will require funds. We know that we will need to seek additional contributions from other faithful Christians in addition to our own in order to realize this vision. That request will come, eventually. But, for now, I’ll close by asking for your support of the Chapel’s work in prayer above all. Pray that our minds be clear and mindful of God’s commands (particularly Matt. 28:19-20), and pray that those in our community would hear the message of Christ through our efforts. In the meantime, we’ll continue to worship, pray, and study. All are invited to join us.